Be the authority. I can’t stress this enough. You must prove to Google that your website is an authority on a topic. Create valuable content. Teach your users how to do something. Take them on a journey. Be a thought leader. Inform. You must dive deep into your content with a focus on creating the best page out there! Create a quality user experience. Mobile friendly and pages that load fast should be a given in 2019. What you want is ENGAGEMENT. Your visitor needs to play videos, scroll through pages, images, comment, use your tools, download something, register, comment, pin, share and so forth. The more that engage, the more Google deems it as a quality page for the search term (query) that person typed into Google. SEO is used as a description for a person, someone that does search engine optimization as a job, and as a verb “I’m going to search engine optimize this website”. It’s the act of optimizing websites, pages, content, videos and so forth in a way that is believed to be or proven to be a way to rank on the search engines. While much of what you already know still applies, such as links, user experience, on page SEO, technical SEO and so forth, there’s some key things to pay attention to where it comes to ranking on Google in 2019. Reported to be the 3rd largest ranking signal, Rankbrain measures user interactions from the results page. It’s counting clicks, time on site, click through rate and bounces among other things. Learn more about RankBrain. When all other things are equal, the search engines will reward the most topical website. Using a real estate example, when we look for homes for sale, we see results like Zillow, Redfin, Trulia and other local brokerages. Most appear the same on the page. Yet when we change the search to Condos in Las Vegas, we now see several websites appear that specializes in condos. Their entire website is about condos. They are not trying to be a jack of all trades. They are about condos. Google sees and rewards the difference. And when we change it once more, to high rise Condos in Las Vegas, we now see a high rise condo website in the #1 position. While all real estate agents show and talk about condos, this website is specifically about high rise condos. The more you can focus a website on the same topic, the same language, and the semantically related keywords, the better it will rank for that topic. I’m not suggesting you pop up a bunch of small niche websites instead of one website unless you have the time, energy, resources, and money to do more than one. Otherwise, you dilute your efforts. It’s a choice only you can make for your business. It’s not about word count, it’s about covering a topic in depth and creating the most comprehensive piece on the topic. While it’s not specifically about word count, there is a correlation between page one ranking results and pages that have 1800+ words. When I’m getting ready to publish a blog or article, I use my favorite tool by SEMrush. 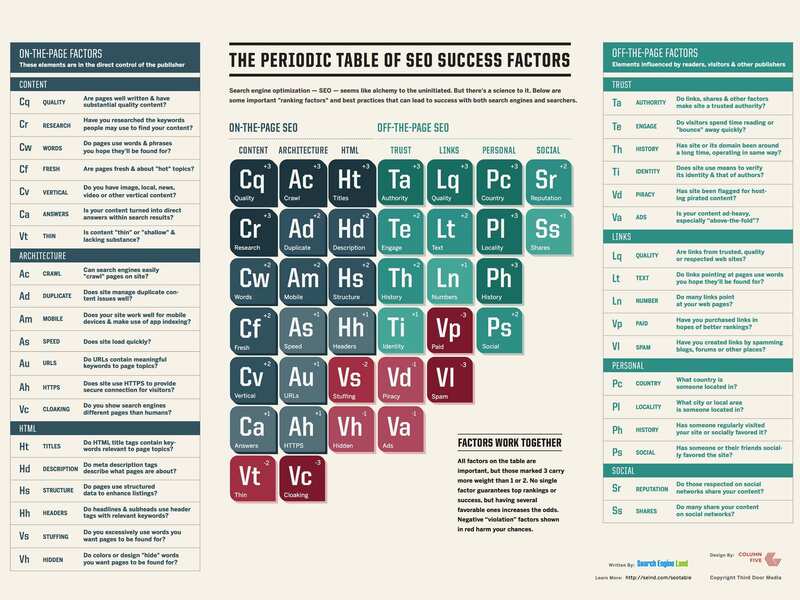 They have a featured called the SEO Template. Here, I can type in a keyword, and then search globally or locally to measure the page one ranking content. The SEO template tells me the average word count. This gives me a good idea as to how deep others have dived into the topic, and what I’ll have to do to stand a chance in ranking against them. The tool also gives you the ability to sort by Desktop or Mobile Results. In this case, the results aren’t too scary. The average word count for “how to buy a house” is only 1353 words. 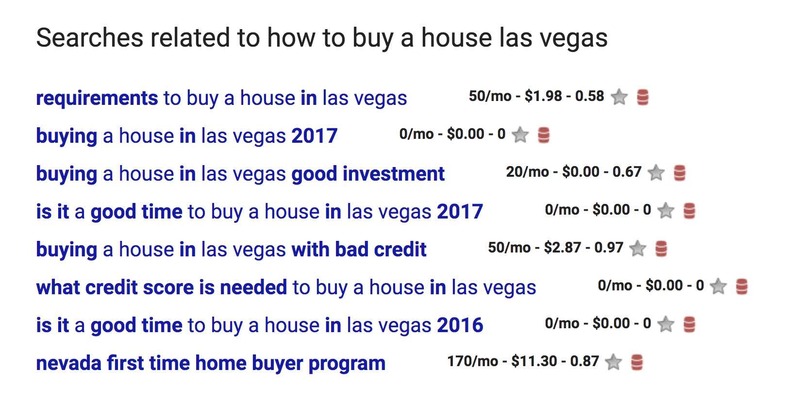 In my case, for my Las Vegas Real Estate Agent Website, I wanted to be sure I had the most comprehensive guide locally. My page on How to Buy a House in Las Vegas is well over 10,000 words long. I didn’t create it overnight. I actually created many smaller blog posts around specific items and then gathered them into one “Pillar” post. While it probably won’t ever make it to page one for the competitive term “how to buy a house”, It holds many #1 positions locally and globally and has a total of 383 keywords that rank in the top 100 positions on Google. The magic is in the longtail keywords. It’s a powerful thing to know what keywords you rank for on Google, and what keywords each page ranks for so you can move the needle! Rather than old-school SEO stuffing, which had us putting in the same word over and over, Google now expects to see related keywords. LSI stands for Latent Semantic Indexing. Google wants to see semantically related keywords when covering a topic. Essentially, Google gathers data around top ranked pages in a particular topic. Then it looks to see what keywords they have in common. It figures, if you have created a valuable piece of content, your page will also include these items. Using, again, our SEMrush Content template, we can see that when covering the topic buying a house, Google might also expect to see semantically related words like afford, interest rate, mortgage calculator, credit score, customer service, price range, mortgage payment, real estate, house hunting, closing costs, home inspection and so forth. A free tool you can use for this is actually Google itself. After typing in “how to buy a house” and then scrolling to the bottom for results, I can see suggestions by Google. Look at some of the keywords these suggestions include. The People also ask box is also very telling as to what Google believes are related questions. Simply change your search to a question: “How do I buy a house” and you will see the results box. Now you can assume that Google may also look for the keywords: Realtor, Down Payment, Loan, Preapproved and so on. And what’s more, is that each of these questions, when clicked, offer MORE suggestions. It’s truly gold, and it’s free. Lori Ballen has created a complete at home lead generation course for you. This Video course, called Rank Like A Boss, is designed to teach you the skills you need to generate more traffic by ranking on search engines, social engines, and video engines. Through blogging, video creation, and more content marketing, you’ll learn how you can take advantage of today’s digital marketing strategies. Also available is the Rank Like a Boss Expansion Pack (formally known as The Ballen Method). It’s been said again and again that your website must be mobile friendly. Google has taken this to another level by putting a new ranking system in place for mobile. No longer can your mobile website be a “version” of your desktop. It needs to be the other way around. Google now states that your mobile website is your true website and your desktop is the “other version”. It’s important to create consistency between the two websites, Desktop and Mobile. They should look alike, and act alike, although one is simply on a smaller device. Mobile friendly isn’t enough. Your website must be mobile responsive. There is a difference. And if your website purely pushes to an app when someone accesses it on mobile, you will be ranking as an app, not as a mobile website. This could be brutal for you as mobile-first indexing rolls out. It was sometime last year when we began changing our blogging strategy for both our Las Vegas Homes for Sale website and our Real Estate Lead Generation Systems and Websites company Ballen Brands. My true focus went to the marketing company. I’ll use it as an example. First, we took to Youtube. The focus was to make as many training videos as possible and begin to rank Youtube videos on both the channel and on the search engines. We add captions to each and transcribe the video. The video and transcript are then added to the website as a blog post. It includes a call to action and the transcript is optimized with internal links, blockquotes, highlighted text and so forth. It’s amazing how long a transcript can be and how deep you cover a topic on video. It’s 2019!! People are bored with long chunky text. They need something to hold their attention. Video has been on a massive rise over the past decade and it shows no signs of slowing its incline. According to a report on Statista.com on the frequency of internet users in the US watching Youtube Videos, 35% are watching them several times a day. Another report states that 55% of Google searches return video results. With SEMrush, you can actually track keywords in your projects, and it will tell you which keywords return a video result. Then you will know which keywords to build videos around. Sometimes, I don’t even create the video. I embed one someone else made from Youtube. Before you get concerned about stealing content, it’s actually encouraged and appreciated. The Youtube license allows for us to embed any video that has permitted embedding. The video uploader can turn it off if they don’t want their video embedded. If they don’t have it on, the embed will be faded out and you will not be able to access the embed code. 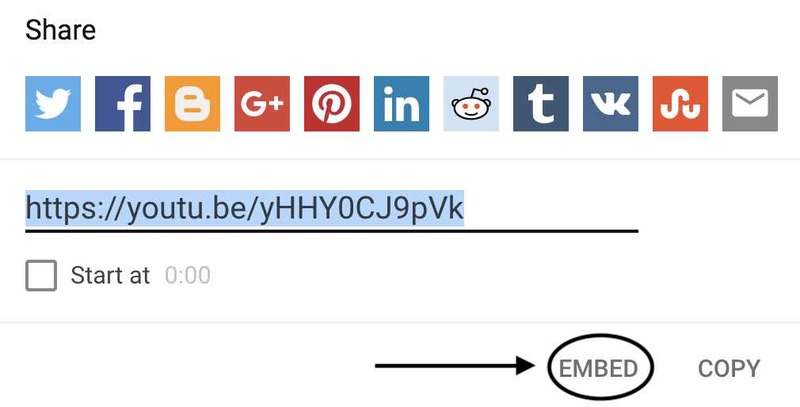 As long as the Youtube Video has the embed option on, you can embed the video on your website. Just make sure you agree with what’s on the video and that you are not directly promoting a local competitor (as in real estate). While Google still holds the majority of the market share and has held study, Bing is working hard to narrow the gap. Many businesses have been tracked spending 80% of their marketing budget on Pay Per Click Strategies (Search and Social) and only 20% on SEO. Yet we know that most of the clicks on a search engine results page go to the NON paid, organic listings. On the first page of Google, the first five unsponsored, earned in organic results take 67.60% of all the clicks. Position 6 to 10 only get 3.73%. Sounds like businesses may need to consider flipping that budget right? You might be thinking, I can’t compete with that!!! You may have a hard time with the competitive head terms such as “Miami Real Estate” but might find an opportunity for “How to Sell a House in Miami in 10 days” or “How to buy a house in Miami with no money down”. These are called long-tail phrases and although they have fewer searches than the larger, more used keywords, you can do a big business in the “niches” and by drilling down into topical pieces. You also do not have to be an SEO expert to get your content ranking on Google! Just follow some best practices, create great content, and you might just find yourself gaining search traffic to your website! Here’s more information on How to Hire an SEO. SEO stands for search engine optimization. My SEO definition is a focus on strategies that will lead to placement on the search engine results pages (often referred to as SERPS) when a user performs a search (query). Google has hundreds of ranking factors in its complex algorithms. While both are equally important, there are some major differences between the applications of on page SEO, what you do on the website itself, and Off Page SEO, which you can’t completely control, yet can improve. You may find that you are able to implement on page SEO in-house, yet need to find outside help for optimizing Off Page SEO. Before you get to the infographic, Here’s an article on how to earn site links. Here’s a look at some of the on-page optimization that can help with ranking on Google and other search engines. Optimize your Images. Alt Text is there to describe the image for the blind. Do not stuff keywords. Use if they make sense. Create Long-form Content (Think around 2000 words. If the topic is competitive, 500 words isn’t going to cut it anymore people!). Adding in a table of contents, as you see here in this blog post can help improve the user experience by allowing the user to click on the section that they want right now. Here are instructions on adding a table of contents. SEMrush has an amazing tool for identifying how to create SEO content that can compete on page one. ⭐ One of the top strategies adopted by businesses today is an SEO focused content strategy. Putting your time, money, and energy into creating quality, valuable content stands to yield high returns on your investment. Some of the top positions held by websites today are earned in through quality, long-form content. These pages typically work to inform or educate the user. You’ll find top pages are often thousands of words long. Let’s take “How to Patch a Hole” for example. (Great example since this was a real search I performed recently). Here’s some noticeable take-away’s from the top performing ranking pages. The #4 Position keenly uses a title tag modifier by adding (see pictures) to the end of their URL. Here’s an in-depth, comprehensive guide to Optimizing Content for the Search Engines. ➡Lowes earned a Featured rich Snippet in the 0 position or “knowledge box”. This is a coveted position! See where it reads Small Holes, has an image and then a list? Here’s how they earned that featured rich snippet. They created great long-form content with images. They made their “how to” blog with steps. These steps became the structured data used in the rich snippet. Not unlike the zero position, these answers are also formulated from web pages ranking high for that particular keyword. 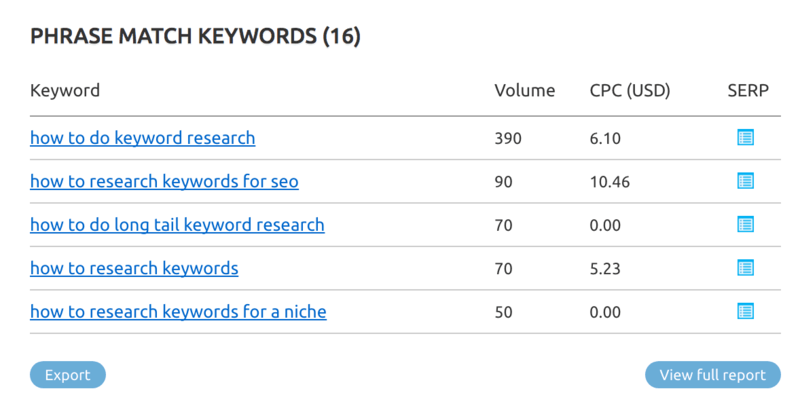 These are generally more long tail keywords (3+ words used together to make a more targeted phrase). Each of these positions is also earned in by top quality pages with in-depth content on a subject and the answer links to the ranking page. Ranking in the “People also ask” section should also be a goal of any website providing information. One way to do this is to create several long tail blog posts and be sure to include the question and then an answer. Create steps wherever possible and number them or use bullet points. You can spell out “Step One, Step Two” as well. Google is pretty smart. You’ll notice when you click on one of the questions, another box opens and adds more questions related to that one. first get “how to patch a hole” in the box. and then, How do you fix a screw hole that is stripped. Remember those old choose your own ending mystery books? Depending on what page you went to, the ending changed? This is just like that. One clever strategy is to create each long tail post and then one long-form post. The long form post dives deep into the general topic. Each long tail post links BACK to the long form blog post. You can duplicate the small long tail blog posts on the long form post if you use a rel=canonical attribute. Here’s more on rel=Canonical from YOAST. This tells Google, I understand I’ve used blocks of similar content on 2 pages and I’d like the credit to go to the long form post. You can still rank for both, and each can rank independently for certain keywords. Optimizing your website for Local SEO can be as simple as keeping your NAP (Name, Address, and Phone) the same across all of your channels. Your website should be included in the same format as well. 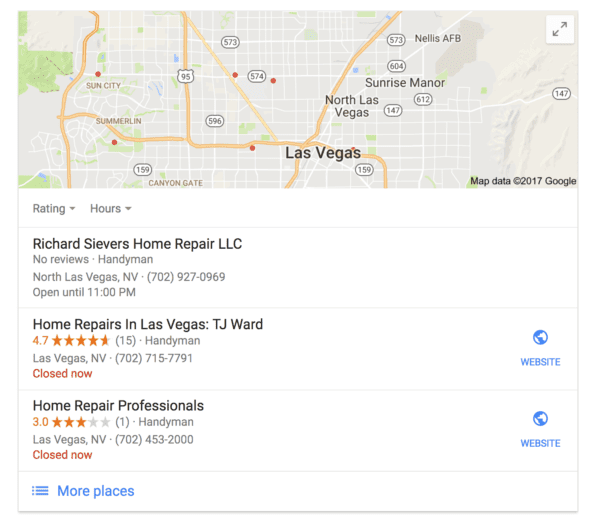 These local citations can increase your chances of showing up in Google’s local search pack. In this example, I typed “Home Repair” into Google. Notice that all of the results returned are for the Las Vegas Area. Yet I did not type in the word Las Vegas. Based on IP address, and shared location with Google from previous log in’s, Google knows where I am searching from. It works to return local results first wherever it makes the most sense. Notice the results all have the keyword “Home Repair” in their business title. 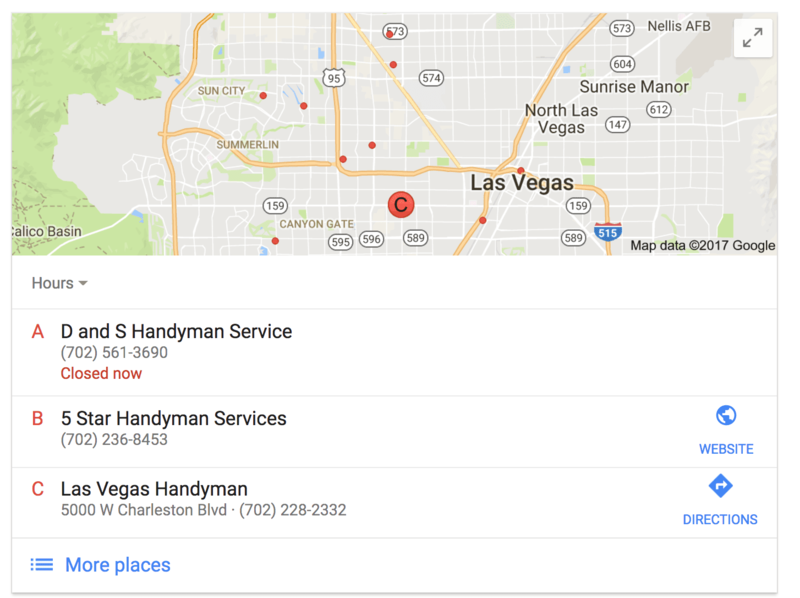 These results are formatted from Google’s local business database called “Google My Business” which you can set up yourself very quickly. In the next example, I simply changed my search from Home Repair to Handyman. Notice now the results change and only include business names containing the word “HandyMan”. This is one of those times where keywords in the main title (business name) really makes a difference. White Hat and Black Hat are descriptions used as a noun, to describe a person, and as a verb, to describe an action. This is similar to the term SEO. People often think of White Hat as being good, and Black Hat as Being Bad. White hat SEO’s typically follow Google’s quality guidelines. They are focused on doing what the search engines like and hope to be rewarded for doing so. White Hat SEO is a focus on quality. An example of White Hat SEO would be an in-depth article with what could be thousands of words (called long-form content), implementing proper SEO such as semantically related keywords, heading tags, optimized images, and internal links. An example of White Hat SEO would be a focus on obtaining quality backlinks from related sources that Google would deem credible. For example, you’ve written a great local article on the real estate market. You reach out to the local newspaper and suggest that they may enjoy sharing your article with their users. You’ve created an amazing infographic on the rise and fall of the local real estate market they can use. In doing so, they link back to your graphic or article. Black Hat SEO’s tend to look for loopholes and opportunities to “game” the search engines in a way that causes massive results, and fast results. Black Hat SEO is risky, yet can have large rewards and many swear by the processes. An example of Black Hat SEO would be buying fake reviews on your Google Plus account because you learned that reviews can increase your SEO. At one time, buying backlinks was a preferred activity by Black Hat’s who were eventually penalized by Google’s Penguin algorithm. Google has many algorithms, which are automated functions rolled out to improve the search experience. Keyword research has much more today with topical ideas than it does finding exact match keywords people search on Google to stuff into a blog post. Old school SEO had us research that way. Old school SEO no longer works. New School SEO has us looking for semantically related keywords and additional topical paragraphs we can add to a single long-form blog post. While learning how many searches are performed for a particular keyword can be useful, learning the related phrases can be as well. There are many keyword research tools on the web. From Google’s Keyword Planner (part of Google AdWords accounts), to Spyfu, to Semrush, To Google itself, everything you need is right at your fingertips. In New School SEO, it’s still important to choose a focus keyword. This keyword will be used for on-page SEO. Keyword in Images (Only if appropriate to describe image). We will also use this target keyword to research our competition and discover semantically related keywords. Once you begin ranking on the search engines, you will love to track your positions. Here’s a “How To” Video on exactly how to use a Keyword tool to discover semantically related keywords and how to implement them in your article. Other people have asked: Which Keywords are the best for my real estate agent website? Back in the day, ( I know, here we go again with Old School vs. New School). Back in the day, we published articles every day to encourage Google to crawl our website. The more we posted, the better we ranked. This was back when a few hundred words would cut it before we were saturated with content. Today, freshness still applies. It’s just not done the same way. The content you create must be great. It’s better to create a few pieces of amazing content than to dilute your efforts by creating less than standard blog posts that don’t go anywhere. Instead of creating new posts, you might want to dive deeper into topics you’ve already created by adding more paragraphs of great content, video, infographics and so forth. 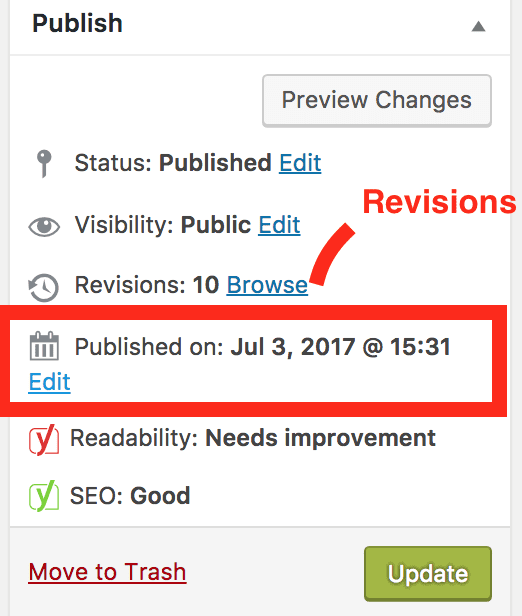 Once you’ve made some great additions to an already superior article, change the publish date to today’s date and let Google go to work! This is another one of those questions that has no easy answer. An SEO company could run thousands a month depending on the work. Content can be purchased through ghostwriters, subcontractors or service companies from as little as a few cents a word to recurring, purchased optimize content as a subscription. SEO requires a commitment to the investment and the time it takes to see a return. While every dollar should be held accountable, and you should be able to obtain reports and see growth, you have to see it through for results. You can do your own SEO work and it will only cost you the price of the tools. If you are a real estate agent, check out The Rank Like A Boss Training Systems and learn SEO in your pajamas. Be Consistent with your Name, Address and Phone Number on all of your website and social channels. As much as you’d like to hear a specific answer is as much as I’d like to give you one. Once you gain search engine visibility, you can have a great blog land on the search engines within hours for particular long tail keyword phrases. With a very aggressive strategy, proper keyword research, great SEO content, on-page and off page SEO, you could begin to see the rewards of rankings within a few months. For others, it could take a year or more. Your plan, implementation, and market set the pace. Is it Time for a New Real Estate Website? Here’s list of the best SEO tools we use in our organization. Long-form content – think 3000-5000 words on your VALUE pieces. Alt tags in images actually describe the image, are not keyword stuffed. AMP – Accelerated Mobile Pages are a growing request by Google. This HTML specification creates “bare bones” on a page for the fastest page load time possible. Style and design go out the window primarily. The content is hosted on Google’s servers. Instant load. Blogging, Google AdWords and more? Check out www.BallenBrands.com. Search results are now unique to the user. Results are based on personalization and location. Google remembers what has been done prior and works hard to return relative results to that user based on history. It remembers what web pages have been visited in the past and is more likely to return those websites again if the user took action or spent some time there. This means, when you perform a search query such as “Top San Diego Real Estate Agent” and you happen to be a San Diego Real Estate Agent, or Google realizes based on intent that YOU are probably looking for YOU, then it may return your page in the results for you higher than it would for someone else. Tip: There’s a browser that is designed to hide all personalization and providing an encrypted search allowing you to see true results of pages on the search engines. RankBrain, it’s most basic essence has one goal: to determine the quality of the search term and what the user wants how the page satisfied the searcher’s goal. It measures how the user interacts with the results. It’s looking at clicks, dwell time (how long someone stays on the page), Click through rate, Essentially it measures what happens from the point someone performs a search query to when they land on the page, and what they do when they get there. With SEO becoming more and more important, search engines had to create a way to utilize it with greater accuracy. For Google, this came in the form of RankBrain. This program is actually not ‘software’ at all, but an artificial intelligence that tracks and processes search data through a learning system. This way, it’s able to continue to adapt and change its own algorithms in order to help provide you or anyone else with the information that they are looking for rather than filling their search feed with spam articles and useless content. This system is not the entirety of the Google search algorithm. Instead, it is one piece of the overall ‘Hummingbird’ system that allows Google to create that list of websites, pages, and information when you type something into the search bar. It is capable of changing the way that results are filed entirely because it allows the algorithm to look at more than just the exact words that are put into the search bar. The system is able to look at what the individual searching might mean instead of just what they might say. The only reason this works is because of the artificial intelligence and machine learning. But what are those? Machine learning means just what it sounds like, the machine is learning on its own. Instead of someone having to tell it that one keyword search means the same as another, it manages to figure that out and put together its own algorithm. Artificial intelligence is the fact that the machine is actually able to learn and take in knowledge by teaching and working things out for itself like a human does. RankBrain is still a relatively new development for Google. Yet as of 2019, it’s reported to be one of the top 3 ranking signals. It uses the algorithm that it created to figure out what you’re really saying and what results you’re really looking for and then it gives them to you. How many times have you sat down at the computer and tried to think of the right way to phrase your question or your query before typing it in? And then when you do type it in you get results that weren’t what you planned. That’s where RankBrain comes into it. This system is designed to help the Hummingbird algorithm figure out not just what you said, but what you actually meant. It uses searches from you and everyone else to help create an additional algorithm that will combine different search results into one list. You may search ‘dog training leashes’ but RankBrain may realize that what you’re really looking for is information about leash training for your dog. Your results will reflect a combination of these things. RankBrain will continue to grow and develop on its own because that’s what it is designed to do. As it does, it will be able to provide better and better results for those who search uncommon words. Because it is so good at what it does, it’s actually being used by other search engines as well. Of course, each search engine has had to create their own system, but Bing, for example, uses RankNet. There is still not a true method of comparing the two services to understand which is better than the other, but both are definitely still learning. Google has moved past the “mobile-first” mindset to a focus on the User Experience. Despite what you may have read about any number of SEO strategies, tips, or tricks being more important or having more value than user experience, those other tactics will only help you so much before you, too, become as obsolete as some of those tactics themselves. if you aren’t reaching your desired audience and giving them what they are looking for, you have already lost them. At the end of the day, it is the user that determines the value and success of your marketing efforts by the actions they take when they encounter it. Do they click? Do they enroll? Do they buy? Search engine rankings, above-the-fold calls to action, prominently placed images, and creative anchor text do not make the call when it comes to your marketing success — the actions of your users do. All of the other aspects of SEO, content creation, and web design certainly play a role in influencing the visibility of your marketing material, but no amount of visibility will make someone follow you into your sales funnel unless you are acknowledging, addressing, and meeting the needs of your users. Google measures the user experience based on clicks. Let’s say someone is looking for “homes for sale under $400,000 in Las Vegas”. They type this into the search bar on Google. Your page appears on the SERP (Search Engine Results Page) and the user clicks. Unfortunately, they didn’t land on a page of homes for sale under $400,000 but instead, the page has luxury home listings. It is possible your page is ranking for a term not as related to what that person performing the query. The visitor bounces back to the search engine (referred to as pogo-sticking) and performs a new search. Google remembers now that that page was not relative to that visitor and therefore may lower the page for that query (search term). Satisfy the search query. Give the user what they want. Consider using Google Analytics and Google Search Console to measure click through and bounce rates. Build on a mobile responsive site: Google search is higher than 50% now on mobile than it is on a desktop. You must measure each page of content for its performance on mobile.Designing on a desktop is fine as long as you think mobile.Big blocks of text look fine on a desktop and will fit above the fold. Yet when you take that same 1000 words on a smartphone, it could be several finger scrolls. Break up heavy chunks of text with images, video, and related articles. Don’t let the user get bored scrolling. Make sure your pages load fast: Under 3 Seconds. Promote your Brand -Use your brand whenever possible. You want people learning your brand in association. A brand is powerful for SEO although it may not be a specific ranking factor. On all advertising, create a statement that says “Search (your brand)” on Google.Join Rand Fishkin on his Whiteboard Friday to learn more about brand search. Create a lot of value packed content. You’ll know it’s valuable when people spend time on your site or accomplish your goal for the page. The goal could be to download something, play something, click somewhere, or comment.Using Clicky, at a glance you measure the amount of traffic on your website for a particular time, the average number of actions a user takes, their average time per visit, the bounce rate and how well your goals were achieved. Create Local content as much as possible. Hyperlocal for real estate is incredibly powerful. Hyperlocal is laser targeted on a small geographic area such as a neighborhood or zip code or are around a school. Make sure you have set up your NAP (Name Address Phone) the same on all of your website and social profiles.Be sure you have your Google Place – (Google Business) established. Google prefers to show local results first where applicable. Possum is a new algorithm focused on local results. Create single topic pages. Don’t work to optimize a page for more than one topic. Keep pages single focused and pack in as much valuable content around that topic as you can. Topic 2.) What repairs should I make to my property before selling it? Topic 4.) I have multiple offers on my property, which should I take? While all 3 topics are about sellers and can eventually be combined to create one overall comprehensive guide, each topic can be talked about at length and answer a very specific question. As a best practice, you would include EACH of the other pages as suggested or related articles assuming that the seller would also be interested in the other topics. Keep in mind on page SEO, but understand that most are just best practices. What’s more important is your content. It’s still important to know how people search: Although keywords on the page are less important, it’s still important to know how people search and create topics around these phrases. Use broad match when using keyword tools. Google now knows that ‘cute puppies’ are the same as ‘adorable young dogs’. Use exact match terms only when it makes sense. You are creating a page about your services, you might call it: How our Real Estate Services Work. That would be natural. Yet if you title your page: Las Vegas Real Estate Agent Real Estate Services, it’s less natural and could appear spammy. Keep in mind, Google will understand: Realtor®, Real Estate Agent, Real Estate Consultant and so forth are probably the same person. If you have chosen How our Real Estate Services Work and are targeting Real Estate Services as your goal for the page to rank for, then you’d include that phrase in the title, H1 Tag, and content as a best practice. Ultimately, Google will decide what it believes the page is about and will rank it accordingly. This page is about where to see Christmas Lights on houses in Las Vegas. The original goal keyword was “Christmas Light Displays”. Google decided to rank this page for 120 other keyword phrases even though the page was not “optimized” specifically for these phrases. Here’s a few of those as reported from the ranking tool we use SEMRush. Decide in advance what phase in the sales funnel will your content satisfy. Top-of-funnel is going to bring traffic to your website by the search engines with visitors that are just barely beginning the process. They are not yet ready to buy. They are probably just gathering information. You may find your blogs, not designed to sell anything, actually do better in the top of the funnel. Google understands the difference between a “know-query” and a “do-query”. It knows when someone wants to find information about something, or wants to do something. Real Estate Example of a “know- query”: Someone in Indiana is considering a move to Florida, California, Las Vegas, or Arizona when they retire.They won’t retire for a few years but are starting to consider locations. They might perform a “know-query” such as “What are the average temperatures in December in Las Vegas”. They might search “Things to do in Phoenix, AZ” or “What is the cost of living in Palm Beach?”. These would be top of funnel searches. These blogs are designed to inform, educate, and possibly invite.Your blog post would introduce them to your website. Google will also likely store A personalized memory increasing the odds that the visitor may find you again in the future when searching your location. You could include an offer on your blog post such as “Get the monthly Palm Springs Real Estate Market Report”, or “Introducing North Las Vegas – Your Area Guide”. Now you have brought in a “lead” and can cultivate while you move them through the funnel.Someone further along in the funnel may be ready to buy. They are going to perform a “do-query” that looks something like “find homes for sale in Las Vegas with a pool”, or “shop listings in Boca Raton with a map”. Bigger is Better – Build, Build, Build. That being said, build with quality. The more pages, the more blogs, the more likely you are to rank. There is a “stacking” factor with exposure to the search engines. Link internally. When you have another page or article related to a word or phrase you use in a paragraph on a blog post or webpage, highlight that word or article and link internally to another page on your website that is appropriate. This used to be a bigger factor in SEO, yet it still provides a quality user experience when done well, increasing actions. When Google sees these actions, it will equate to value for the visitor. Don’t create them in an order to “cheat” Google. Example sentence in a blog post: So if you are thinking about selling your house, it might be in your best interest to have a home appraisal before you even have a buyer. The phrase “home appraisal” is now hyperlinked to a page on the website that is all about appraisals. Don’t try to use exact match keywords to links. It could appear spammy. Get Reviews! Reviews are a growing factor in SEO. Google wants to return a reputable business. Put this on the front focus for 2019 and get as many quality reviews as you can on Facebook, Yelp, Zillow, Google +, Whatever applies. Get SOCIAL! Share, Post, and Be Seen. Create content that others share. We BELIEVE social signals will be a ranking factor in the near future. Make sure you have social links on your web pages pointing to your social profiles. On your social profiles, have links back to your website. Auto posts are not super effective. Better to post natively.A pic post with included link generally performs better than a simple uploaded link. People also SEARCH the social engines, so include words. 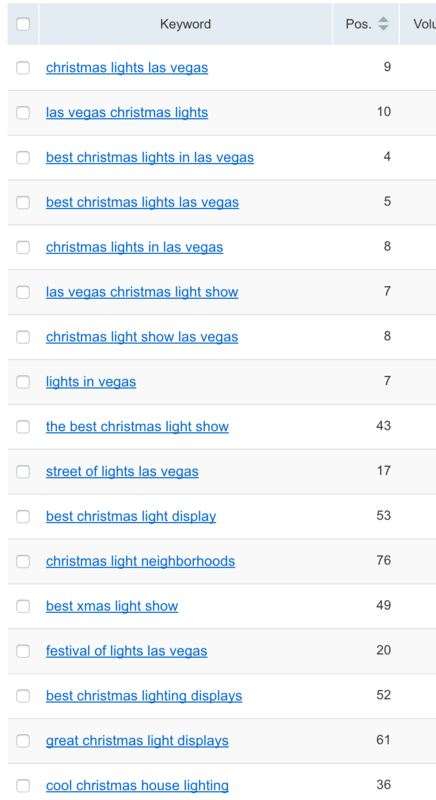 Clicks from social are at least an indirect signal if not a direct signal with the search engines.Real Estate Example of Viral Content: Best places to see holiday lights in Vegas. 80,000 web visits and 2000 leads during one holiday season!!!!! Gain Quality Only Links: Find Influencers to talk about you and share your links. Backlinks are still a factor, yet much less than they once were. If you are going to work on getting backlinks, find related industries to share your articles.They must be high authority sites (like news), a “follow” link where possible, and be quality – not spammy. Don’t say “I’ll share your link if you’ll share mine”. Keep your WordPress Theme and PlugIn’s updated – A Hacked website will tank on SEO! Build your Blog with Posts and Categories. When you post a lot of great valuable blog posts under a category, you BOOST the ranking of the category itself which can be huge for your website traffic. Panda Update Could my website suffer on the search engines if it doesn’t have much content? Designed to drop poor quality and thin content websites in rankings. Backlinks: Links from Other websites Do Backlinks Still Matter in 2019? Backlinks are essentially when one website has a link to your website. Quality links to your website from a trusted, relative source can still create a boost. http:// vs. https:// Do I need https on my website? What is a secure certificate? HTTPS does correlate with higher ranking web pages. Grammar and Spelling Do I need to worry about spelling on my website? Google is looking to provide results that offer a quality user experience. The proper use of grammar and spelling would be a benefit. Domain Age Does an older domain name rank better than a new domain? Direct or indirect, the length of a domain can indicate site value. A new site can outrank an older site with quality content and a great user experience. Domain Registration Length Does it matter how long I register my domain for? It matters. A longer domain name registration signals Google that you plan to build a legitimate website. 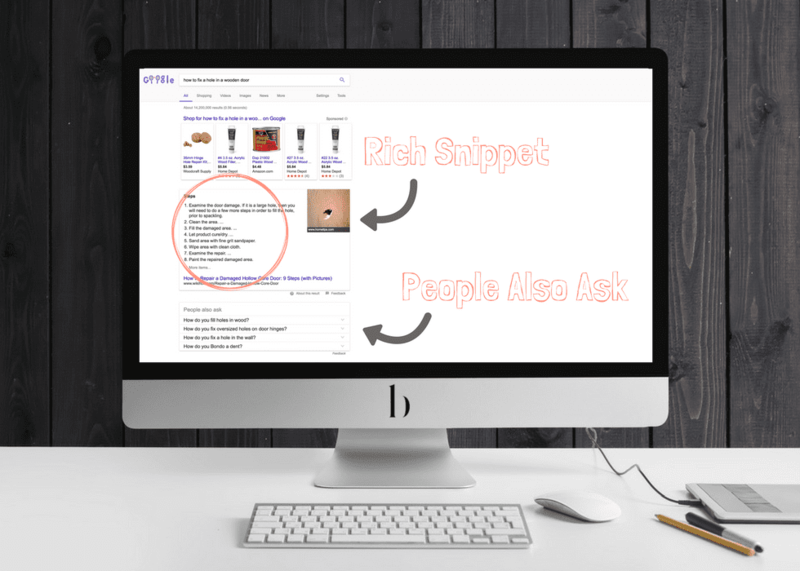 Schema Markup for Rich Snippets How can I get a rich snippet on Google? Simple code or plugin that allows you to markup your page or post as a blog, article, video etc. Local SEO How can I get my website to rank better locally? By keeping your local citations consistent, you stand a better chance of ranking locally. Bullets and Lists How can I make my content easier to digest? Use Bullets and lists. This is especially true on Mobile. Mobile First Index How can I rank first on mobile devices? Google is focused on a mobile-first world and is indexing accordingly. Rel=Canonical How can I tell Google which page is the original form of the content to avoid duplicate content? Adding the Rel=canonical attribute signals to google its content origin, but Google will still determine which to rank. HTML Errors How do I know if my website has HTML errors? You should watch for HTML errors. Consider a tool like SEMrush for regular reports. Latent Semantic Indexing How does Google compare web pages when determining who ranks higher? Google looks for similar words on the page that are found in other top ranking pages. 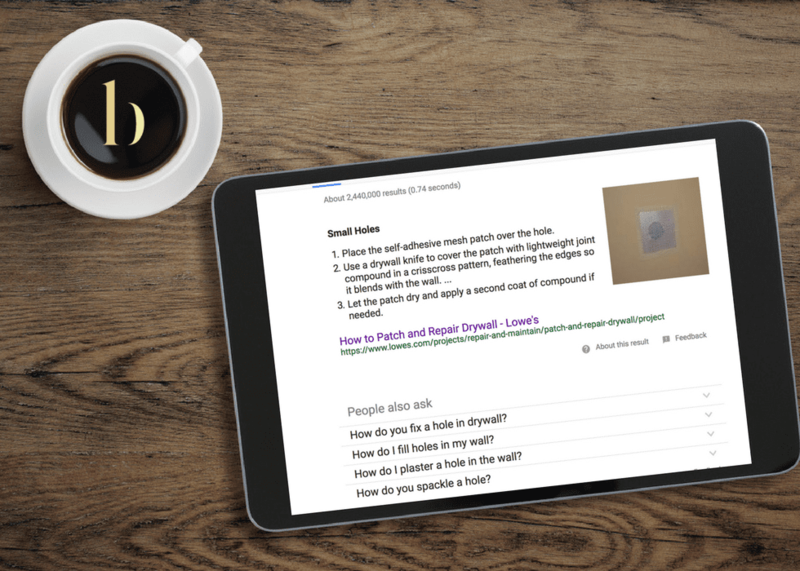 Rank Brain How does Google’s artificial learning work? Google’s Artificial Intelligence designed to learn and create better results based on user actions. 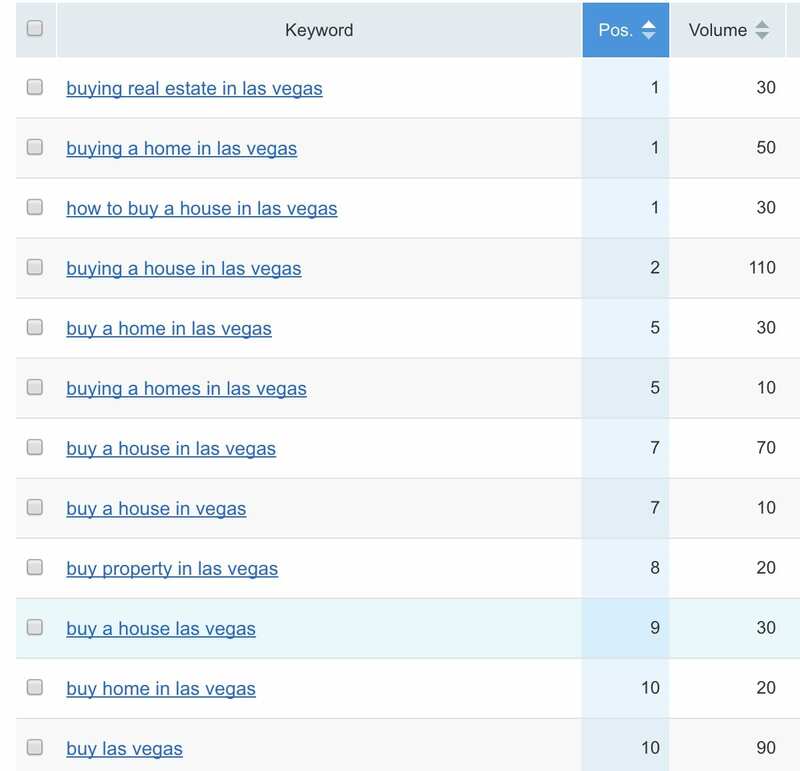 Keyword Density How many keywords should be in my blog post or on my web page? Less is More. Semantically related keywords are more powerful. Number of pages How many pages should my website have to rank well in the search engines? While there isn’t a particular number, the more content, the more likely you are to rank. The key is having quality content worth ranking. You could have 20 pages that rank better than 20,000 if the 20 are quality rather than the 20,000. Longform Content How many words do I need to my blog post or web page? The average page one Google Ranking has over 1800 words. This doesn’t mean you always need this. A simple answer or low competition phrase can have much less. Keywords in the Title Tag How should I title my blog post or web page? A focused keyword should be toward the front of the title tag. Is my website’s architecture hurting my rankings? Start with a path of parent pages and what you will build under them. Categories and posts are great architecture and can help with ranking categories as well as posts. Make sure your pages can all be crawled. Country TLD (Top Level Domain) Registration Should I add a country extension to my domain name? While this could help you locally, it could hurt you globally. You have to decide based on your audience. Multimedia Should I add video to my website? Images, videos, and additional multimedia elements can act as a content quality signal. Avoid Pop-Ups Should I have pop up’s on my website? Pop-up ads (interstitials) that lock content in exchange for information deter users, increase bounce rates and destroy trust. Avoid these on first landing pages designed to rank well on the search engines. Public vs. Private WhoIs domain registration Should I keep my domain registrant information private or make it public? A private domain could be a signal of something to hide. If you don’t have a reason to hide, keep it public. Outbound Links Should I link to other websites from mine? Yes. Choose relative, authoritative websites to link out to. This is considered a positive signal. Have the link open in a new window. Syndicated Content Should I post a blog on my website that is already syndicated on the web? If it’s someone else’s content, and it’s wildly distributed, avoidance is suggested. Syndicating your own content can be beneficial. Duplicate Content Should I use a template for my webpages? Your website should have original content without “spammy” repeat content throughout the website. Readability Should I use expansive vocabulary in my blog posts. Keep it simple. Depending on your audience, simplifying the language for easier readability can be a positive signal with the search engines. HTML Heading Tags (H1-H6) What are Heading tags? Indicate most important topics on a page. Topic Relevant Content What content should I create to rank on the Search Engines? Focus on one single topic per page or post, and cover it in depth. Complete Meta description What is a Meta description and what is it used for? While no longer rumored to be a direct ranking factor, Google will still bold the keywords in the meta description that match the searcher’s query (keyword phrase). Anchor Text with internal links – Avoid exact keyword match What is internal linking? A link to another page on your own website is internal linking. When done well, internal linking can be a benefit. When “Spammy” it can trip the spam filters. User Experience What is user experience and how is it measured? A quality user experience is determined by the actions the user takes on the website if any. Keyword in the top 100 words Where should I place the keyword I want to rank for? In the title tag, and in the top 100 words on the page as well as the Htags. Better to use similar words after that than to repeat intentionally. Bounce Rates Why are my bounce rates so high? High bounce rates may indicate a poor user experience. Check quality content, page load speed, intrusive pop-ups etc. Domain Authority Why does someone’s website outrank mine? Quite simply, if two websites are otherwise equal, the domain authority can cause one to rank higher. Affiliate links Will it hurt my SEO to include affiliate links on my website? If you have a few quality outbound affiliate links, it shouldn’t be an issue with you on the search engines. Anything spammy is an issue so watch your volume and quality. Sitemap Do I need to submit a sitemap? Make sure you have one. Many WordPress themes and plugins already have one. You can add yours to Google’s Search Console. Site Uptime and Downtime Who should I host my website with? Make sure your server can handle the workload and choose a host that will keep your website up. We suggest Flywheel. Breadcrumbs Do I need to use breadcrumbs on my site? You don’t need to use breadcrumbs but they can help improve navigation and the user experience. User Reviews Does having more reviews help me rank on Google? Reviews are considered to be a growing factor in ranking. In 2019, this should be a focus. Social Shares Does having my website shared on Facebook help me rank on Google? Social shares are a win no matter how you cut it. SEO’s debate about shares and social links being direct ranking factors. If they generate traffic, and the users engage with your content, there’s reason to believe this can help you with the search engines. Organic Click Through Rate Does my click-through rate from a keyword increase my ranking? There is a direct correlation between click-through rate and higher rankings. You can see your top keyword click-through rates through Google Search Console. Optimize titles and meta descriptions to increase click-through rate. Repeat Traffic (Measure with Google Analytics) Should I pay attention to first-time visitors and Repeat visitors? Both first-time visits and repeat visits are valuable. Repeat visitors are a sign of a quality website. This “stickiness” can be a positive signal to Google. Bookmarked Sites Is it a positive signal when my webpage is bookmarked? It’s a positive signal when a webpage is bookmarked in Chrome. Geo-targeting Can it help to focus my content on a geographic user? Geo-targeting is considered a ranking signal. Of course, we see this specifically in our pay per click ads where we target location. Brand Search Does using my brand as a target keyword help with SEO? Brand search is tracked and can be a positive ranking factor. Google will correlate brand + item or service as well.